All the features and dependability of an expensive industrial grade drill press—with a price tag that's astoundingly low. Includes built-in light (bulb not included). CSA certified meeting CSA C22.2 #71.2-10 and UL 987-8th Edition standards! Approximate shipping weight: 148 lbs. This product arrived with a lot of damage to it. Luckily Grizzly customer service was helpful and sent me replacement parts and talked me through on how to install them. Unfortunately, judging by other customer reviews, it's pretty common for Grizzly products to arrive damaged. 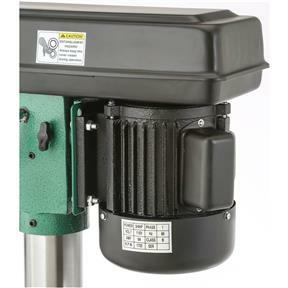 The only use this drill press has seen has been on test pieces during installation and repair. It seems like it will be an okay tool. This bench top drill press is more than what I probably needed for my home work shop, it will handle anything that I come across. I have been a woodworker for 30 years. I was skeptical about an online purchase that I couldn't see and touch. I ordered on a Monday afternoon and it arrived early Thursday morning. It was well packed and the manual made it easy to assemble. The quality of the machine was above my expectations. Grizzly's catalog is about an 1 1/4" thick and full of goodies for woodworkers. I won't hesitate to purchase from Grizzly in the future. I built a rolling stand for this drill and it makes it more versatile. 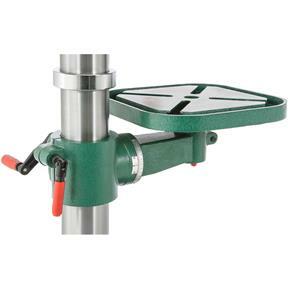 This drillpress is a very good value. It has its limits but is a solid machine. The product was damaged when received but Grizzly "stepped up" and took care of the problem immediately. I understand $&^% happens, but it is what the company does after is what counts and Grizzly certainly performed excellence. The drill press packed well and arrived I damaged. Set up was straightforward. It has been operating perfectly. I would definitely recommend this. Packaged super well. Very easy assembly. Plenty of strength. I have not used the drill to do any work yet, but I am impressed with the quality of the machine. The drill press is very heavy duty. I haven't used it much yet. The only reason I gave it a four was it looked like the motor box had been drop on the belt side. The belt cover is dented consistent with it being dropped. The drill and motor are very heavy. Had to downsize my shop and no room for my floor drill press. I had some reservations when I ordered my bench model from you...when it arrived I unpacked it and completed my assembly and did a test drive". This thing is a monster! 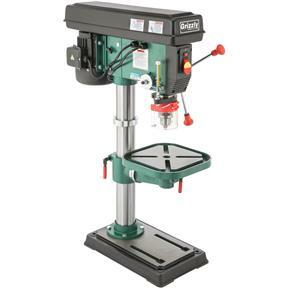 I would compare my Grizzly drill press to anything on the market at two to three times the price and I am very, very pleased. The drill is good and solid. Assembly was straightforward although cleaning all the protective grease off the parts was a bit tedious. Only issue I have is that the floating pully came loose in shipment and banged the hell out of the pully case. However customer support shipped a new one. I still have yet to replace the damaged piece but it does not look to be too daunting. I bought this a couple weeks ago, and it ran great out of the box. Get help to put the head on, as it is very, very heavy. I also had the experience others are having with the belt cover having shipping damage. Grizzly is great about returns, and they definitely don't give any hassle. With the belt cover damage, the idler pulley shaft was bent, and they replaced that too, and threw in a couple belts and shipped overnight! Regarding the removal of the spindle pulley to remove the belt cover, don't get a puller. Make some light taps with a rubber mallet against the side of the pulley toward the base of the shaft, perpendicular to the shaft axis, while turning the pulley so you have taps all around the axis. *Light* taps will knock it loose, and it will pull straight out without effort. I hope they figure out something different for shipping the drill press head to better protect the belt drive cover. This seems to be a consistent issue with shipment for other folks. Oh, and if you're oscillating between the bench or the floor model, the only difference is the column, so if you think you need to switch later, you can just buy the column. The head is the same. Like others, I have been drooling over this drill press for a long time. The sale price finally did it. The unit arrived fairly quickly MO - FLA. However, as others have reported, the belt housing was damaged in shipping. I think the weight of the motor assembly is just too much for the packaging. Perhaps the housing should be shipped separately and assembled on-site. Nonetheless, One call to Grizzly's excellence customer service department resulted in a new housing being delivered within a few days. Replacement was fairly easy, although it requires a pulley puller. I have used the unit to drill some 4" holes in 3/4 plywood so far. It comes set at the highest speed, so be sure to set the proper speed before using. SLIGHT wobble with bits. Can't figure out how to get rid of it. 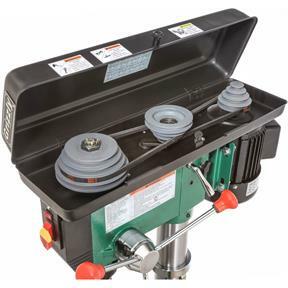 This is very nice bench drill press I purchased to replace a smaller unit I purchased at home depot several years ago. 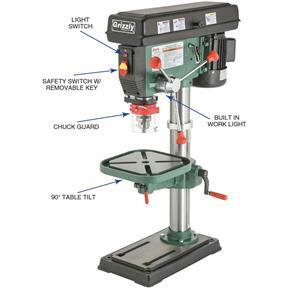 I replaced my Wen bench top drill press with the Grizzly and it is light years ahead of the Wen. Fabulous product! I purchased 3 of these for a production project. Quality seems good compared to some other similar drill presses I looked at. The belt guards on all three were bent from shipping and had to be straightened. They are rather thin sheetmetal and bend easily. 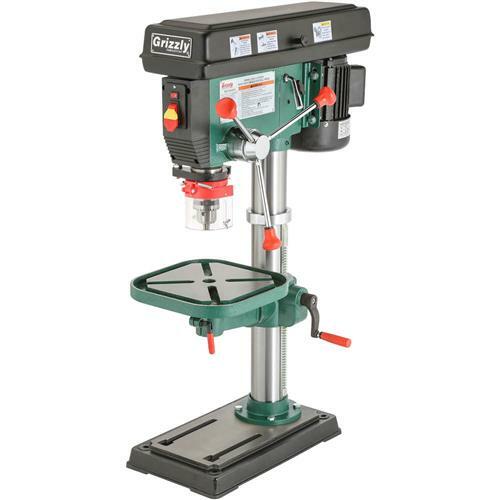 I purchased this drill press for my son as a gift. He has set it up in his work space and says it's great. It is very rugged and performs perfectly! I am pleased with the machine so far. But am disappointed with some shipping damage. 1.Drive belt lid has a dent in it. 2.On and off switch housing has a large broken place in the front. Purchased this drill press after friend recommended. A bit disappointed when inadequate packaging lead to pulley cover being damaged during shipping. Company send another pulley cover. On replacing pulley cover, I realized it was not simply removing four screws as described. After a short discussion, representative agreed to send the needed pulley puller. Have used drill press for drilling through 3/16 inch steel with no problems. Light feature is helpful. Pulley placement/speed chart inside pulley cover could be larger. Works well. Some cosmetic damage from shipping. There is an issue with the motor chug-chugging and not spinning up to speed for certain speeds. Loosening and then re-tensioning the belts seems to do the trick. Bought this visiting family and brought it back to Canada. It's a heavy duty unit for sure, had to repack it into one box to fit it into our car! Looking forward to using it for lots of projects and also want to get a sliding table for it to make it more flexible and precise. I had a smaller bench drill press before, this one is much more capable with more features, which we will appreciate as we get into more complex projects. some small adjustments and cleaning up castings were required, this drill press is a good value and functions quite well. This machine was purchased because our floor press couldn't run slow enough for a rosette cutter on a particular job. Over all a good value. I would like to see a quick adjustable depth stop on the machine however. Bought this to upgrade from my older Craftsman 12" drill press. The Grizzly is a serious upgrade which I am very happy with. Would recommend to anybody looking for a bench top unit. When I opened the box and got this BEAST put together, it was much more than I expected !!! 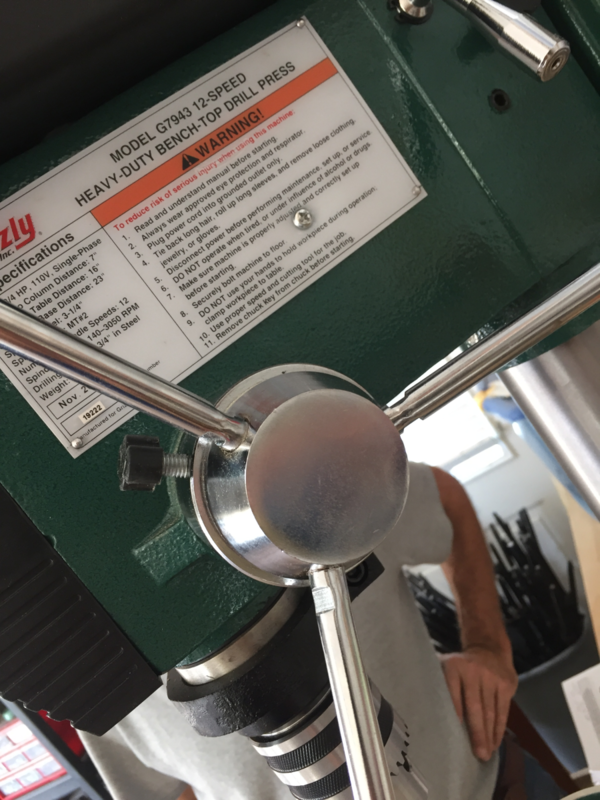 When they say it's a "HD" drill press, they mean it ! The only difference between the bench and floor model is the vertical column. I did have a minor issue in that the arbor was missing....ONE call, told the rep what was wrong, he said "No problem", it shipped the same day, and I had it a few days later---Customer Service at it's finest !!!! Highly recommend the DP and Grizzly !!!! I bought you inexpensive router table. Drilling the holes for my Bosch router was easy as the plate has multiple marked circles so it was easy to line up withing a few thousandths. Table was easy to assemble and it is already getting a lot of use. I bought a Bosch table mounting bracket and so the router easily pops in and out. This machine is rugged enough for anything I'll be repairing on the farm. I would say that the chuck has a tendency to fall out. This is likely due to my own impatience; not cleaning it enough prior to inserting. Not quite certain what to do to remedy this, other than better cleaning and perhaps polishing the inside and out somehow. Other than that, an excellent machine. I pretty much do not give five stars for anything. I have had the drill press about a month. Better than expected. Accurate and easy to use. I was able to put it together by myself but i agree a second person is the way to go. I'm very pleased with this drill in that it can bet set at low RPM for metals and high enough RPM for wood. Bought for my garage shop. I am very happy with it. Top cover was damaged in shipment but not the fault of Grizzly. This is an awfully nice drill press. Very nice in fact. It's also very large and I made a mistake of not buying a floor standing model. It's too tall to use on any average sized table so you need to have an extra short one or a stand for it. Minus one star just because it's a little too much for a table top press but it's very well made and works great so that's nice. Would not recommend because it's awkwardly sized and would recommend a floor standing model over this one. Runout seems to be very minimal (pretty much undetectable). Solid unit all around. Easy to finish assembling. My only difficulty was attaching a woodworking table. I wish the metal table had thru-holes or slots. I'm HUGELY disappointed with my purchase. In building the drill press over the course of a week or more, I could not for the life of me find the arbor. So in desperation, and in quick need of the tool, I called and had a new arbor shipped overnight. This Thursday I receive the new arbor. So I install the arbor and attempt to lower the drill - won't go. With more force than expected I can lower the drill - but it WON'T retrieve back up. It stays extended. Frustrated, I do all I can, then call Tech Support. They were great on the phone, we trouble shot what we could and faced with mailing the tool back, or doing the repair myself - I proceed with repair. Guess what - I remove the spindle hub, and find an arbor lodged behind it and pressed against the gearing. Imagine my surprise. I want a NEW one, which won't happen. I want a full refund on the NEW ARBOR I bought and shipped overnight. I'm assured my issue has been forwarded to a Supervisor somewhere to review and I will get a call in 24 hours. That was Thursday noon. It's Saturday noon and guess what - no response. Grizzly is letting this customer stew and hang apparently. How does mfg let an arbor fall inside the headstock? Where is QA/QC? Where was the inspector before this was packaged? Where is Customer Service when something happens? The Tech Support and Online sales folks were super. Photos below - first a shot of the scared arbor found inside the headstock (motor housing) behind the spindle hub. I bought this drill press. I got to inspect it and was impressed with it. Got it in my building and the next day a storm collapsed the building. I will up date my review I can dig it out and set it up again. I bought this drill press about a month ago but only got round to assembling it tonight. Assembly was a breeze; the instruction manual was very clear and easy to follow. I managed to assemble the unit alone but that's only because I lift weights and am strong enough to wrestle the headstock onto the column by myself; I strongly advise against this if you are not used to lifting at least 100 pounds (a higher weight than the headstock because the unit is a bit awkward to handle). The unit runs well; not having a plumb bob, I am aligning it by using test bores. This seems to work well enough. The chuck has a lot of wobble so much that it is visually obvious, I think they call this run out? Do you know if there is a way to correct this? I tried removing and reinstalling the chuck but that did not help. Other wise the press is very nice and appears to build very solidly. This is over all a great unit. The only thing I would prefer would have been a laser pointer of the exact center of the bit on the surface, but that isn't a major thing. Have only had for a month, haven't had much experience with it yet. First impressions are very good...seems well-made, very good assembly manual information. For the buck this is an amazing deal. Your not going to get an industrial machine for this price. But yippy can get a high quality machine. This is it. 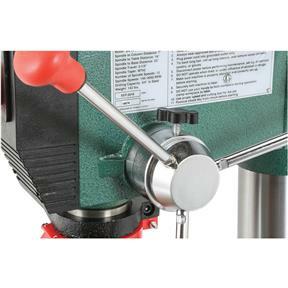 Excellent drill press especially at this price. Very smooth and powerful. I needed a good drill press for small hobby shop use. I had a cheap one from another source but the chuck wobbled. 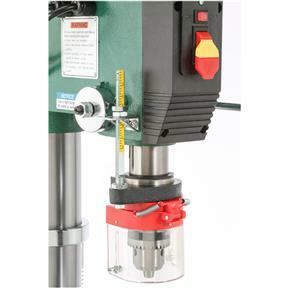 This drill press drills a straight hole, it's heavy and it has power. It's made in china like everything but its a good tool for the smaller shop. This drill press has turned into a real workhorse in my shop. I use with Forstner bits at slow speeds to make items I sell. The speed ranges are perfect for everything I do. It was a superb choice! New arbor with bigger chuck...less than 4 thou runout. Lik all grizzly machine, an excelent product!!!!!! First, let me tell you about Grizzly and their customer service. The drill press had been damaged in shipment and had a severe vibration. After speaking to almost every person in their customer service and technician departments, trying to remedy the situation, Grizzly shipped me a brand new head unit. Without exception, all of the people I spoke with were genuinely concerned and anxious to fix my problem. There were a lot of phone calls back and forth but never was there a doubt in my mind that the people at this company had my interest at heart. 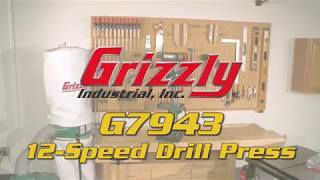 Yes, Grizzly represents a great value in woodworking tools but their customer service is second to none. Thank you, Grizzly. Now, on to the drill press. The G7943 is a replacement for a 9" Craftsman that I had for years. The smaller press served me well for years but really did not like forstner bits and hard maple. For those of you who, like me, are used to a small drill press, wait until you open the box for this baby. It ain't your granny's drill press! This is the real McCoy. The instructions say to have help during assembly and help is definitely required to lift the head unit onto the base unit. This is a man's drill press. After the vibration problem with the damaged unit I was a bit anxious when I turned it on for the first time. No problem. It ran smooth as silk with no untoward noise or vibration. I then installed a 2" forstner bit and a scrap piece of white oak (Didn't want to waste any of my maple.) and proceeded to cut a very nice 2" hole. One earlier reviewer commented that the G7943 was too tall for his bench. Mine is mounted on a mobile cart that is about 30" high. For me it is a very satisfactory height. I also really like the light feature. I did not know I needed it until I had a drill press that had a light. In summary, the G7943 is a good solid tool that I expect to use for years. I would recommend it to anyone. The price is right and the quality is top notch. Have I mentioned the customer service? Had I not had the problem of a damaged unit I would not have had the experience with the people at Grizzly. They turned what could have been unpleasant into in good experience. I now have four pieces of Grizzly green equipment and am looking forward to my next purchase. I use it all the time and it's a great machine. I love this drill press but I have one major issue with it. The handle to move the quill protrudes too far in front of the drill press head and at the height the drill press sits on my high work bench I tend to hit my head on the it during set-up. I guess if I could rotate the handle 10 degrees or so it wouldn't be a problem but I haven't looked into doing this as of this writing. What I have done was to move the handle out of my head's way and to lock it in place until I go to use it. This is a minor issue I just live with. This drill press replaces a Ryobi automatic speed and although it takes a little longer to change the speed we're only talking seconds so it's no big deal. 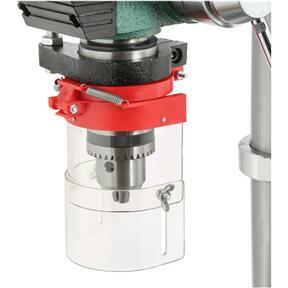 The drill press is made very solid and is well worth the price. I did a lot of research and found that this unit has the lowest adjustable speed, which I prefer for Forstner bits and is worth the price. In addition, adjusting the quill depth is very simple and more accurate then the Ryobi that I replaced. You guys have been great to deal with. 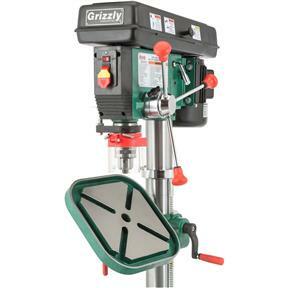 I love the drill press and will buy Grizzly for my future needs. I am very pleased with the performance of my new Grizzly 12" bench-top drill press! No run out what so ever great torque! 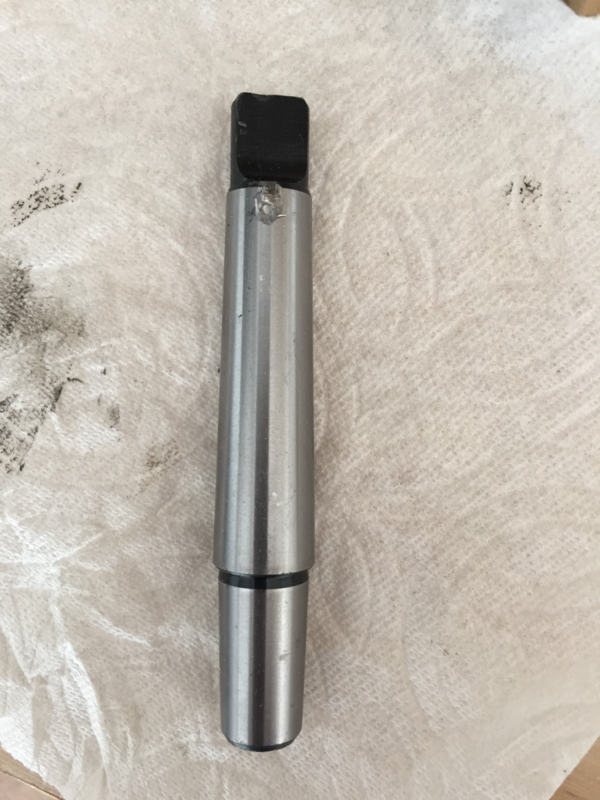 I didn't receive a chuck key for the drill. Otherwise it's a great drill press. I recently bought a 14" bench top drill press. Very pleased with the quality and pricing. My unit received some minor damage to the pulley cover during shipping. The people in customer service were Great! They sent me the parts I needed to make repairs. Technical Dept. helped with information I needed to get the job done. I couldn't be more pleased with the help I received. I certainly will be looking at Grizzly for future purchases. Very, very happy! Needed this to complete my shop! From metal to wood mortising it's done an excellent job. Speed changes are straightforward. Repetitive drilling is not a chore anymore and the chuck allows me to change from extra small drill size for projects like knives or jewelry to large diameter boring without changing the chuck. I am impressed with this drill press. I was not impressed with the packaging used to ship it as it arrived with considerable damage to the drill and not much damage to the packaging. Grizzly was responsive in sending replacement parts but some of the parts I couldn't get off to change and who wants the hassle when buying new. Overall I like it but feel like I didn't really get my money's worth given the damage. It wasn't practical to send it back to them for replacement as it weighs 150 pounds so some discount in the price would have been appreciated. Nice, solid, precise drill press. Well worth it. Easy to assemble and no adjustments necessary. All the features and capacities of a floor model but at a bench top price and footprint! Everything was well machined and went together without any issues. A nice addition would have been a storage slot for the chuck key. The drill was received ahead of the estimated delivery date. I highly recommend making or buying a drill press table top with a good fence. 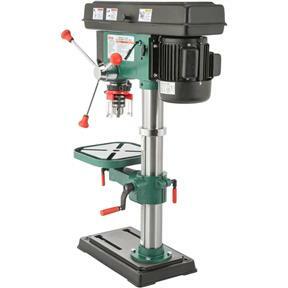 This drill press is very well build and was easy to assemble. The packaging was damaged during shipping and could have been a little more robust. The performance of the drill press so far has exceed my expectations.